The world of landscape lighting is expanding. People are starting to see the benefits that outdoor lighting presents for those nice Maryland summer evenings – and even more so for the fall evenings that are starting to head our way. We’ve still got a little over a month and a half before September hits, but the days are already starting to get slightly shorter (not to depress you; we’ve still got all of August). The point is that outdoor living spaces are becoming more and more popular, and with them, outdoor lighting is growing in popularity. In fact, 98.3% of members of the American Society of Landscape Architects agree that outdoor lighting will be in even higher demand in the coming year. We’ll break it down for you: that means you’re going to be getting more and more options as per the laws of supply and demand! LED Lighting: LEDs are everywhere right now and it’s no mystery why. They save users a good deal of money on their electric bills in a world where almost everything that we use has to be plugged in at one point or another. A landscape company sales representative near Kansas City says of these little, powerful lights, “It can create very soft illumination yet be crisp and clean.” LEDs give users the best of both worlds. Embedded Lights: Essentially lights that don’t scream “HEY, I’M A LIGHT!” People are starting to want lights that are put in decks, installed low in the ground – basically just lighting that can’t easily be seen. It has the desired effect of being bright and lighting up the night, but not in an obnoxious way. It makes the lighting feel natural and comfortable when it might otherwise seem forced and artificial. All different types of lights can be embedded, depending on the effect that you’re going for. 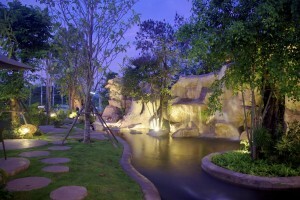 Outdoor lights as accessories: Up until very recently, outdoor lighting was mostly just for practical purposes. People used motion sensor floodlights in rural spaces for safety reasons. Other people lined their walkways to see where they were going with dim solar paneled lights. Today, many people are using lights as a focal point or to highlight the best parts of their home and landscape. Lighting options become better and more numerous all the time! Outdoor Lighting From Aqua-Bright, LLC. At Aqua-Bright, it’s more than just getting the job done, it’s getting the job done right. That’s why we take our time and pay attention to every last detail. Whether it’s installing lawn sprinkler systems, outdoor security lighting, or basement waterproofing, the professionals at Aqua-Bright do the job right. Kevin wouldn’t have it any other way. Call Aqua-Bright today at 410-489-9009, stop in and visit us, or take a tour through our website to get started with your outdoor lighting system. This entry was posted on Thursday, July 17th, 2014	at 7:59 pm	. You can follow any responses to this entry through the RSS 2.0	feed. Both comments and pings are currently closed.